The eye is a complex marvel of nature. In fact, there are some 70 to 80 kinds of cells in the mammalian retina. This image beautifully illuminates the eye’s complexity, on a cellular level—showing how these cells are arranged and wired together to facilitate sight. 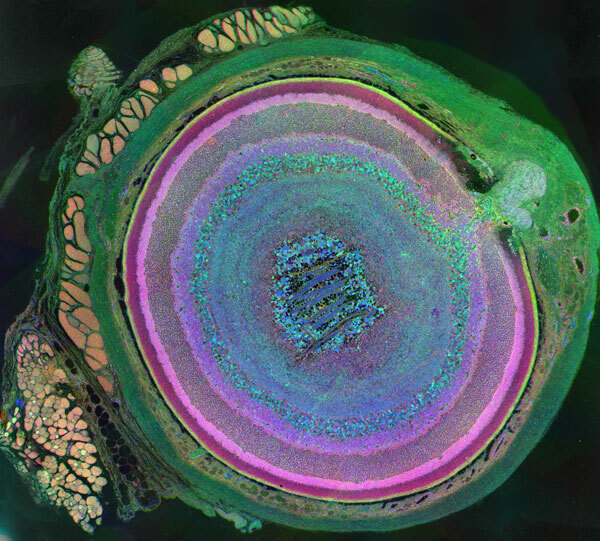 “Reading” the image from left to right, we first find the muscle cells, in peach, that move the eye in its socket. The green layer, next, is the sclera—the white part of the eye. The spongy-looking layers that follow provide blood to the retina. The thin layer of yellow is the retinal pigment epithelium. The photoreceptors, in shades of pink, detect photons and transmit the information to the next layer down: the bipolar and horizontal cells (purple). From the bipolar cells, information flows to the amacrine and ganglion cells (blue, green, and turquoise) and then out of the retina via the optic nerve (the white plume that seems to billow out across the upper-right side of the eye), which transmits data to the brain for processing.